I’ve been doing a lot of shopping recently so thought I’d share some of my latest buys with you guys in a fashion haul! I love sharing what i’ve been buying with you before I style it up because I never really talk about why I brought things and why I love the item in my blog posts, they’re more about the styling and outfit! It also means that they’re all still in store as they’re very recent buys so I thought I’ll keep doing them as soon as I buy things quite regularly as you guys seem to love them anyway! Let me know what you think and if you decide to buy anything then let me know what you get!!! 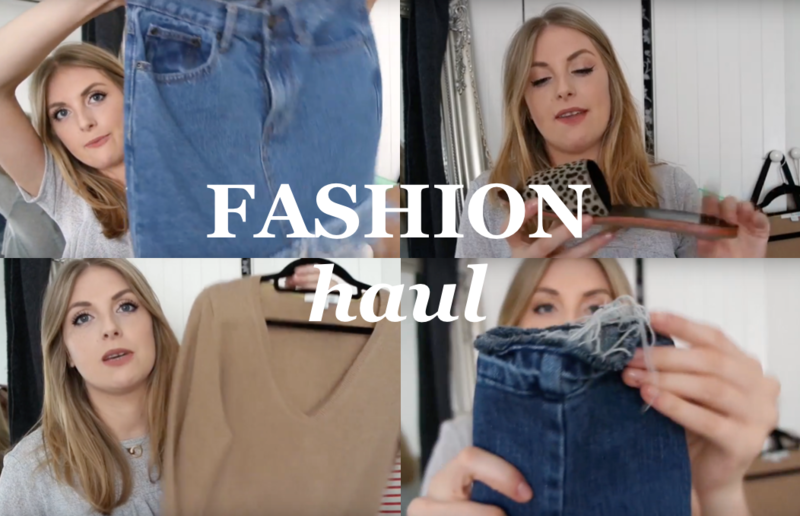 The frayed denim skirt is already my favourite and looks amazing with the little crop top I’m wearing in the video! Shop my fashion haul I’ve linked all of the products below the video on youtube but you can also shop them by clicking and scrolling through the images below! I hope you liked this video! It would mean the world to me if you subscribed to my channel and if you like this video remember to give it a thumbs up! Also make sure you let me know if theres any videos in particular you want to see! I don’t usually do these kinds of posts on the blog but I thought seen as I was doing a youtube video on my April favourites, it’d tie in nicely! To me favourites videos are so much more interesting to watch because you get to see what people have been using and have fallen in love with, I find them particularly good for beauty bits!! This videos a bit of a mix with beauty, fashion and life bits all rolled into one! I’d definitely say that to me the Benefit stuff has stood out the most. The brow gel is the perfect match and gives an amazing natural and defined brow and the cheekathon is ridiculous value for money, not to mention that all 5 shades are all kinds of amazing! Let me know what you think! I’d love it if you subscribed to my youtube and give this video a thumbs up if you like it! Shop My April Favourites I’d love to hear what you guys have been loving this April! I’m always on the lookout for new things to try – especially books! I’m really trying to get back into reading at the minute so would love your recommendations if you have any! One last thing! Let me know if there’s a video you want me to film too! If there’s something particular you want to see, like how to style a certain item, a wardrobe tour, maybe a Q&A or a look at my shoe collection? Let me know! See which products I’m loving and why I think you’ll love them too! I’m talking beauty, fashion and people, everything I have been loving this month! Shop the pieces that I’ve been loving below! Make sure you follow me on Bloglovin’ so you never miss a post and stay up to date with whats new! This week I’ve got a collaboration with Dorothy Perkins, more blogging tips and of how and why I became a stylist with some handy tips and pointers – a much requested video! You can also subscribe to my youtube channel here – I do have a blogging Q&A coming soon as promised but I wasn’t happy with how it turned out so I’m going to re film it when I next get chance!!! !